When you're a intergalactic time traveler who also happens to be hundreds of years old, what's the perfect tool to bring along for the ride? Perhaps a trusty blaster? Maybe just a Swiss Army Knife. Just a screwdriver you say? 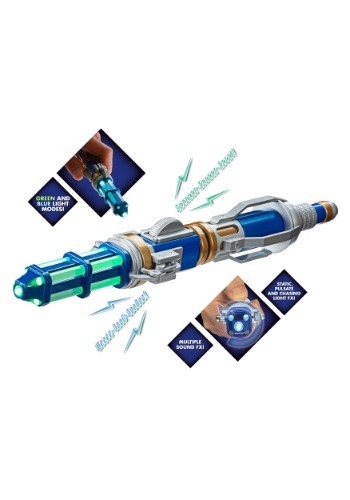 A sonic screwdriver? Is there even such a thing out there? Some dude called the doctor uses it? We're going to need some proof of that. You're saying you have a bunch of photo evidence? Oh we see, you have pictures of different guys who just happen to be hanging around police call boxes in strange locations. We're thinking maybe you had a few too many sonic screwdrivers at the bar. Alright, fair enough. London does get a little weird every time Christmas rolls around. We believe the Doctor's out there trying to save the world. We usually just deny it because we're jealous of all the companions who get to go on adventures with him. If you're like us, you'll want to at least pretend you're our great hero by running around with the latest replica of an officially licensed sonic screwdriver just like the one the 12th doctor uses! Just try not to fool any Daleks. When encountering them we recommend just running.